​Open 7 Days a Week! USA Built! Call 9:00 AM to 10:00 PM EST. 1. 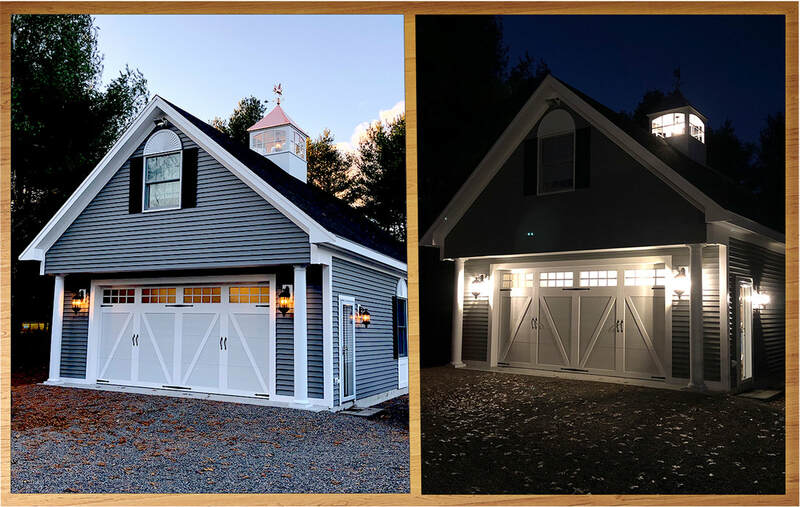 Garage cupolas from day to night! Above you can see a 54" wide CNC Window cupola on an oversized 2-car garage. The garage is about 36' across. This magnificent cupola makes a bold statement and brightens up the night. ​EVERY DAY for Revolutionary Lowest Prices! The photos shown below will show how a cupola will look on a garage, barn or building just like yours. Our cupola professionals will help you select the perfect size and style cupola for your garage. ​On the left is a 28" CNC Window cupola on a 22' garage. 2. 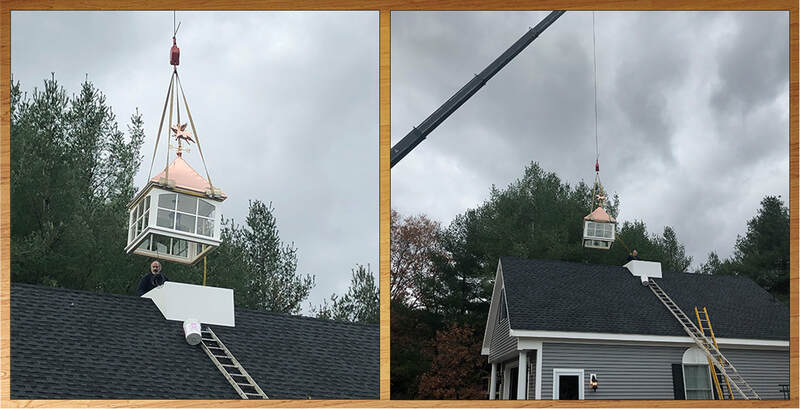 These photos show the installation process for the 54" wide CNC Window Cupola shown in the first photo. ​Also shown is the 9612P Flying Pig Weathervane. The cupola and weathervane sure do look excellent together. 3. Above is shown a fantastic 36" wide CNC Window cupola that also goes from day into night. 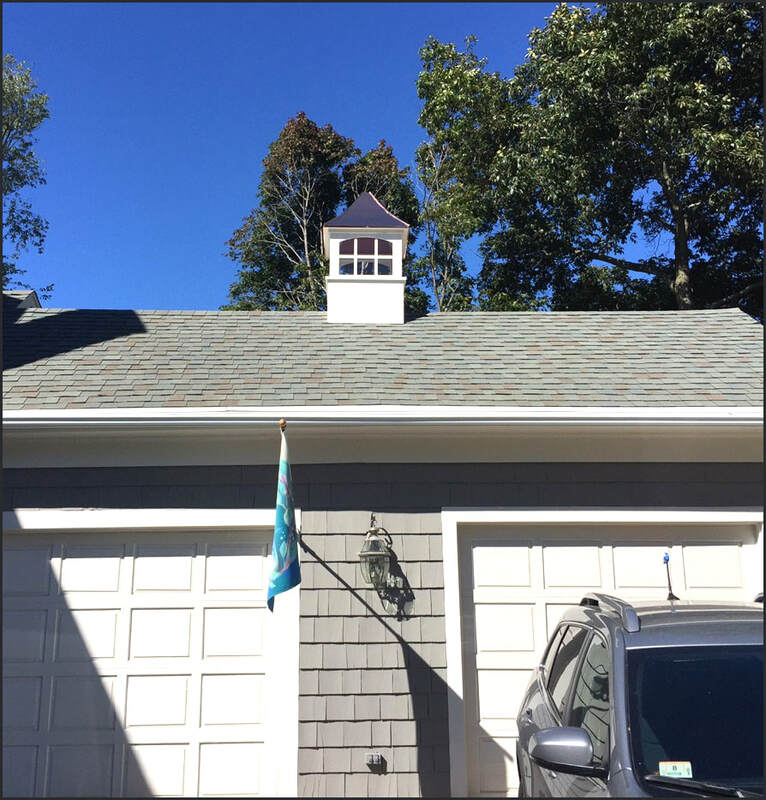 The cupola is shown here on a 28' 2 car garage. What a great addition to this roof. 4. Here you can see a 28' 2-car garage on the left with a 36" Ellsworth style cupola on the garage roof. On the right we see a 30" vinyl CNC Window style cupola on a 24' 2-car garage. Both garages look amazing. 5.. Shown above are two 36" wide Cedar cupolas on larger 2-car garages, about 26-28' wide. On the left is the 36" wide Cedar Ellsworth style cupola. On the right is the 36" wide Waterford style cupola that has both windows and louvers. 6. The garage of this magnificent home has been graced by our 36" vinyl J-Series style cupola. Just beautiful. ​The cupola is shown here on a 26' wide garage. Also shown is the 954P Smithsonian Arrow Weathervane. 7. A 42" wide CNC Window cupola with straight windows can be seen here on a 36' wide 3-car garage. ​Also shown is the 611SP Arrow Weathervane. The cupola and weathervane look great together. 8. 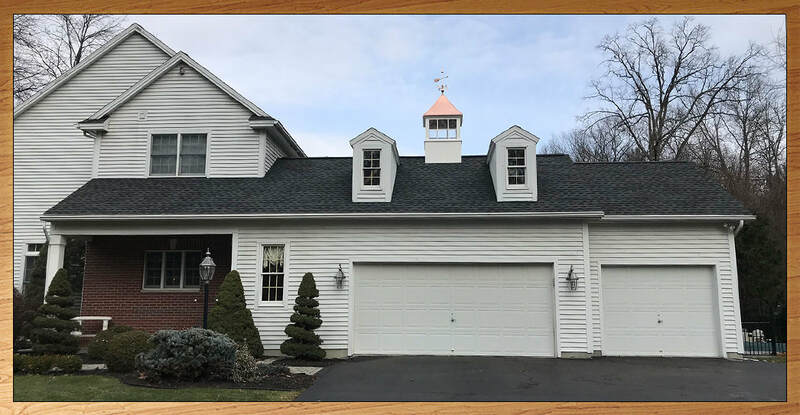 On the left you can see a 36" wide vinyl Alexander style cupola with a Fisherman Weathervane on a 30' wide garage. ​The cupola on the right is a 48" wide vinyl CNC Window cupola with a Patina Roof on a 38' wide building. ​9. The above photo shows our cupolas on large homes with detached garages. On the left is shown a 42" wide vinyl Hexagon with Windows style cupola on a 36' 3-car garage. On the right you can see three 48" wide vinyl Ellsworth style cupolas on a 38' garage and on an 80' span on this large beautiful house. The cupolas are the finishing touch on these beautiful homes. 10. On the left is shown a magnificent 66" wide vinyl Carlisle style cupola on a large 50' wide garage. 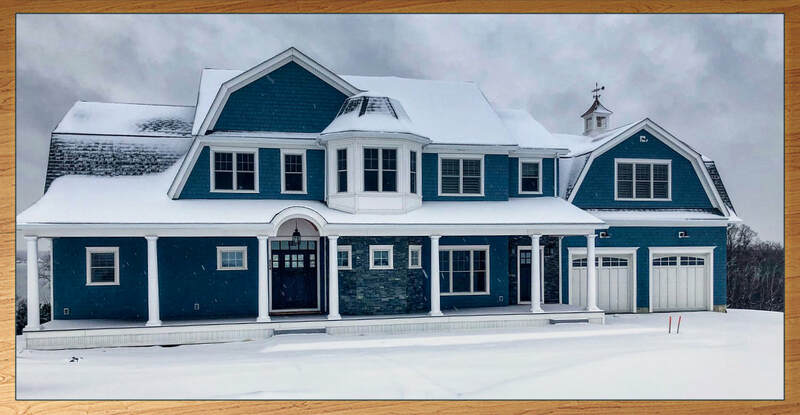 The right side shows one of our popular Custom Roxbury style cupolas with a Bell Rood and custom Crown Molding. Our cupolas have many options. Our customer shown on the left has a 42" Carlisle style cupola. He painted the cupola and added his own shingles to the base. The look is quite fantastic. 72% Off Cupola and Weathervane Sale! 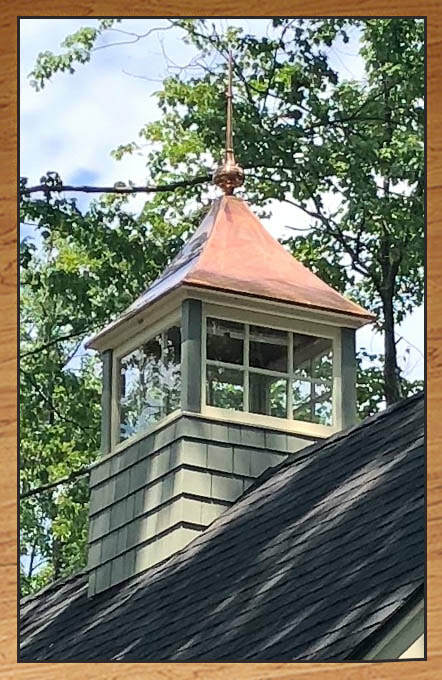 For your FREE quote, email MagicCupolas@ValleyForgeCupolas.com or call 866-400-1776!